Justice Department officials have said that U.S. Attorney General Jeff Sessions wants to talk with state attorneys general about whether social platforms "may be hurting competition and intentionally stifling the free exchange of ideas on their platform." President Trump has accused the tech platforms of suppressing conservative viewpoints. The companies have rejected the allegation. And evidence for anti-conservative bias is unclear. 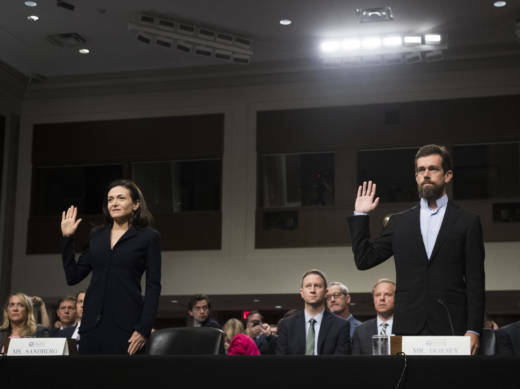 Nonetheless, tech watchers see the meeting as another sign of stricter government scrutiny looming over powerful tech companies such as Facebook, Google and Twitter. California Attorney General Xavier Becerra, a Democrat, has not been invited to the meeting — tentatively slated for Sept. 25 — even though he represents a state that is home to Silicon Valley. He raised his concerns about his potential exclusion in a letter to the DOJ. "If the proposed gathering is meant to be a legitimate examination of the role of technology companies in social media, then states like California, the nation's tech leader and home to a $385 billion tech industry, will be invited," Sarah Lovenheim, adviser to Becerra, said in a statement to NPR. "If it's a political meeting, then that speaks for itself." A Justice Department official told NPR that no official invitations have been sent out by the agency, and federal officials are still in the early stages of planning the meeting. According to the Justice official, the meeting had been discussed among a small group of attorneys general before being announced last week. Since then, "the interest has been overwhelming" and attorneys general of both parties have inquired about participation and received the same acknowledgement of receipt, the official said. "We look forward to participating in the DOJ's upcoming discussion regarding growing concerns that conservative voices are being suppressed on several social media platforms. This matter involves both the central tenets of our country's free market economy and the guaranteed freedom of speech. We must work together to ensure that online economic competition operates fairly and transparently, so that Americans across the political spectrum can make informed choices and the public discourse can flourish." There's a reason why Justice Department officials would be interested in talking with state attorneys general, who can have broad oversight power over social media, thanks to their consumer protection purview. "Consumer protection law in each state is extremely broad and allows them to basically protect consumers — that is citizens, people — from what they believe to be untoward conduct," said Doug Gansler, a former Maryland attorney general. Already, several state attorneys general have been investigating the tech companies. Cases have focused on the collection and use of private data, disclosures of sponsors behind political advertising and how advertisers might exclude people from seeing ads such as those based on race or religion. Typically, state attorneys' cases against companies focus on violations of law or terms and conditions, deception or fraud. However, it is rare for the DOJ to summon state attorneys general for a meeting to direct their focus to a particular part of the industry, said Gansler, a former president of the National Association of Attorneys General. The Justice Department has not said anything about the plan for the meeting beyond interest in concerns that tech companies may be "hurting competition and intentionally stifling the free exchange of ideas." It's unclear how much of the goal is to facilitate a conversation about the allegations of anti-conservative bias versus the antitrust concerns about the size and reach of the leading tech companies. Either way, simply having federal and state officials digging under the hood of the tech companies and requesting incisive details of their algorithmic secret sauce could threaten their business models, said Dipayan Ghosh, a fellow at the Harvard Kennedy School and former policy adviser at Facebook. "I think the internet companies are quite concerned about this — and they should be," Ghosh said. "This is recognition that state attorneys general have tremendous power ... to start a discussion with industry about standards on privacy, standards on security or standards on transparency. I would hope that these can be done in a way that is not politicized." The politics, however, has been an unavoidable part of the conversation. Trump in recent weeks claimed that Google "rigged" search results to surface "bad" stories about him and cited his loss of Twitter followers, which coincided with Twitter's purge of bots and spam accounts. Trump has also warned tech companies to tread carefully on "troubled territory" without citing any specific evidence. "Twitter does not use political ideology to make any decisions, whether related to ranking content on our service or how we enforce our rules. We believe strongly in being impartial, and we strive to enforce our rules impartially. We do not shadowban anyone based on political ideology. In fact, from a simple business perspective and to serve the public conversation, Twitter is incentivized to keep all voices on the platform." The matter of free speech on social media is complex. As private companies, tech giants already decide what type of behavior they will or will not tolerate on their own platforms. For example, they regularly remove offensive or hateful posts, even though there are no laws on this. Last week, Twitter permanently shut down accounts of conspiracy theorist Alex Jones and his outlet InfoWars, citing violations of its policy on abusive behavior. Jones faced similar bans last month from Google's YouTube, Facebook, Apple and Spotify. Jones, who is known for peddling sensational falsehoods about the Sandy Hook shooting and other tragedies, has accused tech companies of censorship. The decision-making about the right balance of speech on social media becomes ever trickier if federal officials and elected politicians such as state attorneys general begin to weigh in. And the DOJ's move is making at least one conservative advocacy group uncomfortable. "The Justice Department should not wield its authority to subjectively pick winners and losers in the tech industry or to police free speech," said David Barnes, a policy manager at the advocacy group Americans for Prosperity, which is backed by the Koch brothers, who tend to support Republican candidates. "Antitrust laws exist for the good of American consumers, not to further the political interests of public officials."